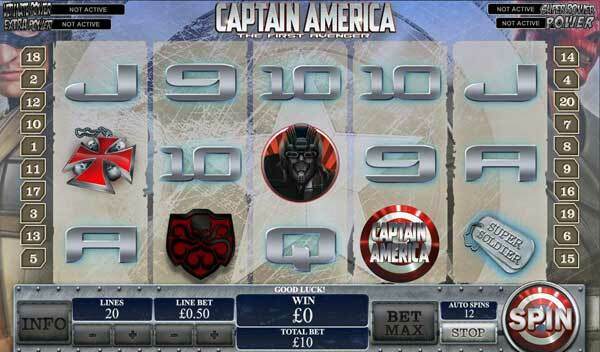 Captain America - The First Avenger is the very latest Marvel Super Hero slots game from Playtech. It offers 5 reels and 20 paylines and has the usual Marvel Slots jackpot bonuses. Spin the reels and obtain a winning symbol combination on any of the 20 active paylines to win a prize. You can win up to 20,000 coins on a single spin. This is the fourteenth online slots game in the Marvel Slots range. It is not one of the better ones but still offers fantastic opportunities for big wins. The game offer bonus features. Get the required scatter symbols on reels 1, 3 and 5 and you will be transported into the FREE GAMES world where the wilds are crazy. The symbols are as you would expect and contain the usual 9 though to A(ce), there are also the Captain America logos and symbols for wilds and scatters. A fair addition to the range, kepping the tradition of the Marvel Super Heroes and offering extra chances to win the Marvel jackpots.